A FNAC test (fine needle aspiration cytology) is a biopsy procedure that is less invasive than a surgical biopsy. It is a simple and inexpensive option for discovering needed information about lumps, particularly lumps in the thyroid gland or the salivary glands. A FNAC test may also be used to examine lumps in the breasts or lymph nodes in various parts of the body. The lump may have been discovered by you, your physician, or with the use of imaging devices such as CT scans, ultrasounds, or mammograms. This test may also be used to measure the effectiveness of treatments administered to patients or to collect tissue for specialized studies. Why Do You Need a FNAC Test? If you have unexplained lumps in your neck or elsewhere, a FNAC test is the easiest way to learn more about it. Previously a surgical biopsy was required. That usually meant a hospital stay, general anesthesia, possible complications, and a big bill. Now, a FNAC test means none of that. Results may be back the same day the test is performed or in as little as 3-4 days. That means the diagnosis is quick and if the lump is malignant, speed is important. Early detection is always an advantage when dealing with cancer. There are very few preparations needed for the FNAC test. You may be asked to avoid taking aspirin or other anti-inflammatory drugs before the procedure or to stop taking blood thinners a couple weeks in advance of the FNAC test. Routine blood tests are usually conducted two weeks before the procedure is scheduled. How Is a FNAC Test Conducted? The FNAC test is a simple procedure that is usually conducted in your physician’s office, the hospital, or an outpatient clinic. The patient usually experiences no trauma and no side effects. It may be performed by a pathologist, a surgeon, or another doctor who has received training in the procedure. Before the test begins, your vital signs will be checked and you may have an intravenous line inserted. If you are very anxious, a sedative may be delivered through this line. For those who are calmer, an oral sedative may be all that is necessary. At the beginning of the test, the skin at the location will be cleaned with antiseptic solution and sterile drapes or towels will be placed around the test site. An injection of a local anesthesia may be administered. If this is a FNAC test for neck lumps, you’ll be asked to lie on your back with a pillow placed under your shoulders and your head tipped back. The doctor may request the use of ultrasound to see the right location to perform the test, especially if the lump is located deep under the skin. You will need to hold still throughout the procedure. A fine, thin needle will be inserted into the suspicious lump and a sample of cells and a small amount of fluid will be aspirated using a simple vacuum type apparatus attached to the syringe. When this has been done, the needle will be removed quickly and pressure will be applied to the wound to control the bleeding. After a small bandage is applied, you’re all done. The entire procedure normally lasts less than 15 minutes. Complications from a FNAC test are few if any. Pain during the procedure is minor, usually no worse than a quick pinch. You may experience slight bruising around the injection site and it may be tender to the touch. Other, more serious complications, such as hemorrhaging or infection, are extremely rare. What Happens to the Specimen Collected? 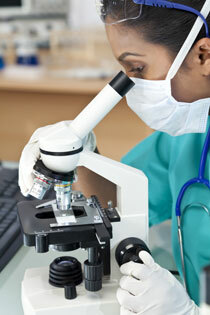 Once a sample of cells and fluid has been collected, it is sent to a pathologist for microscopic examination. If there is enough tissue to analyze, the pathologist will conduct the necessary tests on the specimen. On rare occasions, the pathologist may determine there is not enough material to analyze, then the FNAC test will have to be repeated or it may be decided that a surgical biopsy is necessary. After examining the specimen, the pathologist will reveal the results to your physician. In some cases the test results may even be available on the same day as the procedure but rarely take more than a week. They can pinpoint a bacterial or viral infection and if a tumor is involved, the test will determine if it is benign or malignant. When you talk to the doctor about the test results, ask as many questions as necessary for you to gain a thorough understanding of your condition, such as what is the prognosis, the treatment, and the possible complications? What types of medications do you need to take and what are the follow-up procedures?